A wacky heist comedy romance, The Love Punch is a lightweight travelogue with just a modicum of quality. 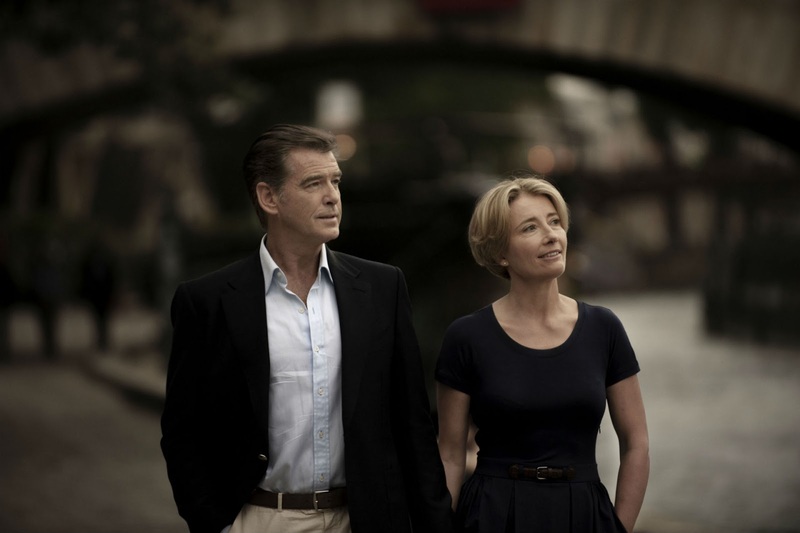 In England, divorced couple Kate and Richard Jones (Emma Thompson and Pierce Brosnan) are approaching retirement age, living separate lives but still on speaking terms. Richard's retirement plans are thrown into disarray when the company he works for is foreclosed by a hedge fund and the pension plan gutted. Vincent Kruger (Laurent Lafitte) is the Paris-based heartless corporate raider, and he is about to get married to the glamorous Manon Fontane (Louise Bourgoin). Kate and Richard concoct a plan to gate-crash the wedding and steal the $10 million diamond necklace that Vincent is gifting Manon. They call upon their friends Jerry and Penelope (Timothy Spall and Celia Imrie) for help, and the foursome plot a raid on the wedding reception being held at a lavish south of France estate. Meanwhile, Richard is doing all he can to win back Kate's heart. Written and directed by Joel Hopkins, The Love Punch is utterly inconsequential but also occasionally harmlessly entertaining. Clearly conceived as a pretext to invest some French production dollars into promoting tourism on the big screen, the plot is a sorry excuse for some lush French scenery. On the slightly positive side, Pierce Brosnan and Emma Thompson inject just enough class to avoid a total loss, and the script throws up a few good quips, many courtesy of a pleasantly gruff Timothy Spall. And within the absurd proposition of four retirees turning to high stakes crime, Hopkins manages to take a few shots at Brosnan's Bond history and offers some smart commentary about love as advancing age replaces giddiness with pragmatism. In pursuit of keeping it real, Kate and Richard find an unlikely ally in Manon, a modern woman who quickly snaps out of her white knight fantasy. But despite the decent moments, The Love Punch is frivolous and ultimately just too silly, a scenic coffee table book converted to moving pictures with actors going through the motions but mostly getting in the way of the glossy imagery. I didn't see any reason to see this when it came out. Sounds like I was right. I never even noticed it when it first came out...!